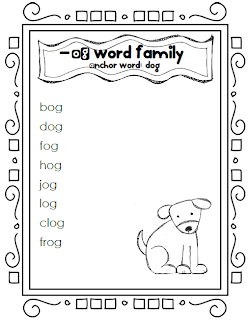 Ready-Set-Read: Word Work Wednesday: What are Word Families? 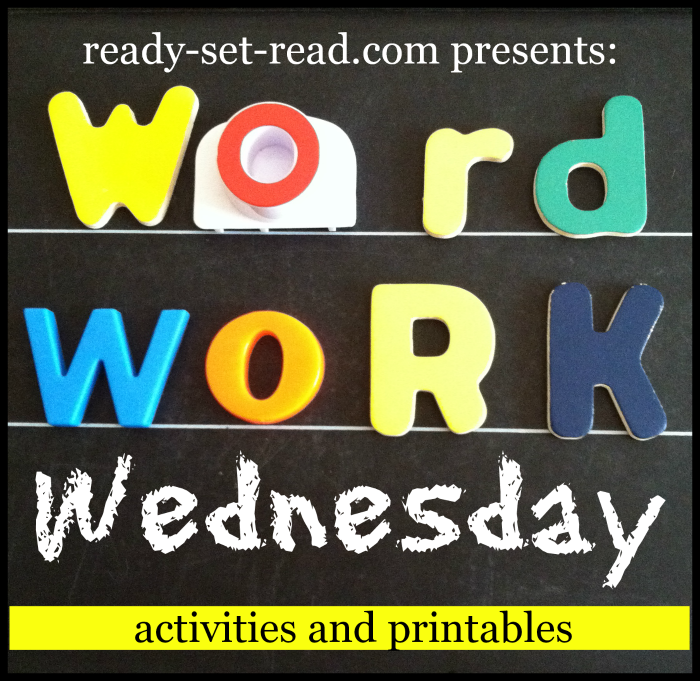 Word Work Wednesday: What are Word Families? When my brand new kindergartener writes notes to me, they generally look like this. "I Lv u Mom. Hv a gd day." Those with a sharp eye are able to interpret this as, "I love you mom. Have a good day." The first notes from your child are wonderful whether they are precisely printed or scribbled as the child sounds out them out phonetically. A child's first notes can give a peek into his or her stage of literacy and help parents and teachers plan for the next step of literacy instruction. A child who is consistantly using beginning sounds and understands basic concepts about print (understands the concept of a word, understands direction of print, etc), may be ready to explore vowels in words. One way to introduce medial vowels is through the study of word families. Word families can help a student's reading and writing vocabulary skyrocket. According to Dr. J Richard Gentry in the book, "Raising Confident Readers", if your reader understands 37 common rimes, he or she will be able to read 500 new words! 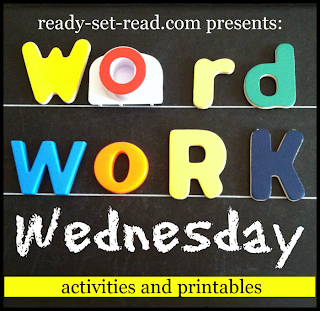 Each Wednesday I will be sharing a new element of word work on ready-set-read. "What are word families?" is the first post in the series. Next week I'll share hands on activities you can use to teach these word families to your readers. Word families are phonograms or words that share the same rime. (ex. fast, past, last, blast, all share the ask rime). (Definition from Words Their Way: Word Study for Phonics, Vocabulary, and Spelling Instruction). Single syllable words can be broken into two parts, onset and rime. The beginning consonant sound is referred to as the onset. It can be a single consonant or a consonant blend. The rime unit is the vowel and any other consonants that follow. Word families are often identified by the rime. For instance, teachers often refer to the -at family, which is the rime in the word cat. The consonant c would be the onset in the word cat. I have compiled these word families into lists on quick reference sheets. These will make it easy to create word work activities without having to search your brain for word lists! You can get your free printable in my Teachers pay Teachers Store or Teachers Notebook Store. I'd love if you'd follow my store while you are there and feel free to leave feedback if you like this freebie. Also, I have included word family posters in the free printable. 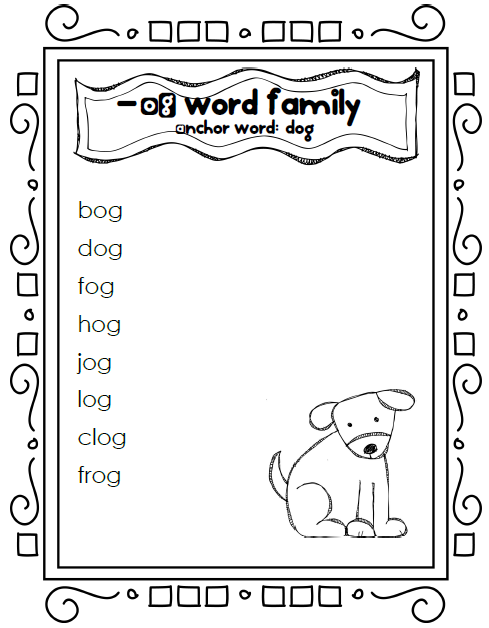 For each word family, there is a full page poster with a word list and a picture of the anchor word. You could color these and use them in a classroom center or hang on a bulletin board. Leave a comment with any creative uses you find for these word lists. You may also enjoy checking out my word work category at Teachers Pay Teachers. You'll find both free and priced items. I've also been pinning resources to Pinterest. You can find lots of activities and games for learning word families. 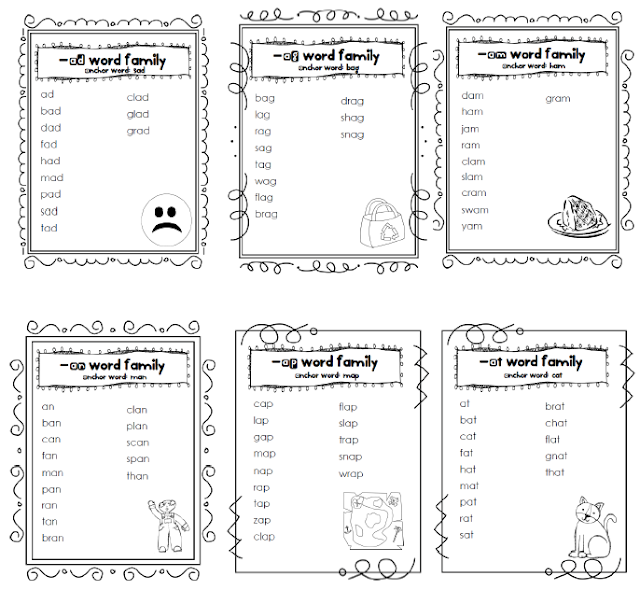 Check out my Word Study: Word Families board. I'd love if you'd follow while you are there! These look like wonderful reading tool! Great job!